Eating disorders such as anorexia nervosa, bulimia, and binge eating are usually associated with younger people. 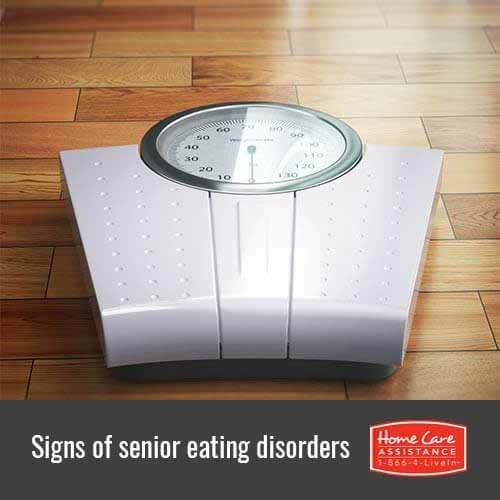 However, eating disorders can also affect the elderly. Providers of live-in care in Rhode Island hope families will pay attention to the following signs that indicate the presence of a senior eating disorder. This may be the most obvious sign of an eating disorder. If there are significant changes in weight, either a loss or gain, this could signal a problem. If your loved one simply cannot make his or her own food, at-home care in Rhode Island may help your senior maintain a healthy weight by preparing healthy meals. People with eating disorders will typically try to hide their behavior. If you notice your elderly loved one suddenly wants to eat alone, especially if he or she only eats in the bedroom, your family member may have an eating disorder. Sometimes people with eating disorders will exhibit strange behavior in an attempt to deter attention or cover up their guilt. They may lash out or even become less energetic if they are lacking nutrition. Watch your loved one carefully to monitor for these unprecedented changes. Aside from weight loss or gain, these are a few of the other physical signals of an eating disorder to watch out for. Lack of proper nutrition causes hair loss, and bulimia causes many problems with dental health as stomach acids can eat at the tooth enamel. It’s common for the elderly to experience digestive issues, which may require dietary aids and laxatives. However, a sudden increase in the use of these medications may signal an eating disorder. If you suspect your loved one has an eating disorder, arrange for a visit to the doctor. Be proactive, supportive, and work with the doctor to help with their treatment. Your loved one will also benefit from Home Care Assistance of Rhode Island if he or she needs assistance maintaining a proper diet. We are a leading provider of home care that delivers inclusive services such as Alzheimer’s, dementia, Parkinson’s, and post-stroke care in Rhode Island. To learn more about our care services and how we can help your loved one, call a knowledgeable Care Manager at (401) 284-0979 today.